Most 10-year-olds spend their days playing Minecraft and posting selfies on Instagram. But not Mackenzie. Last year Mackenzie Hinson volunteered 1,000 hours of service, divided among a host of different causes. She made care packages for families with seriously ill children. She led a team at a local walk for childhood cancer, making dozens of bracelets to help her team raise money. She read to hundreds of small children in schools. She helped pack weekend meal packs at her local food pantry. She raised money for several national charities working with children’s heart disease, diabetes, and stroke prevention. 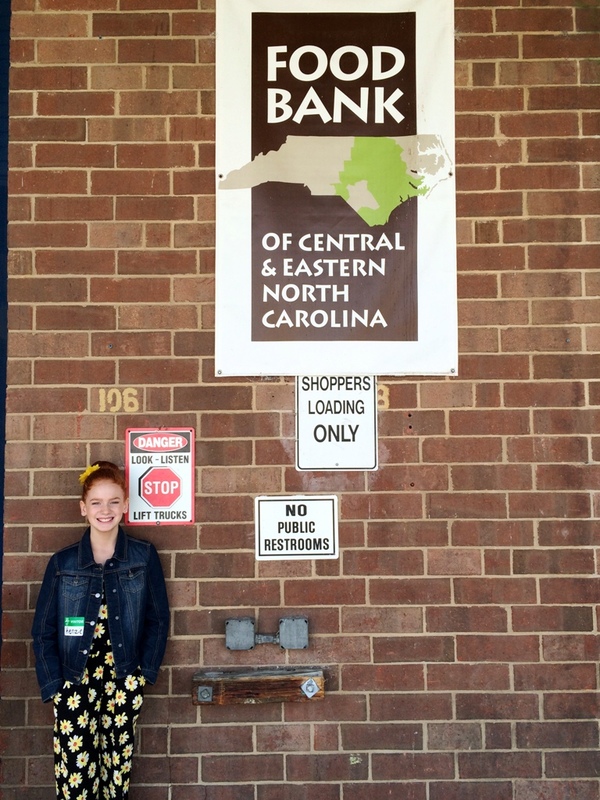 And she spent many of her Saturdays at our Raleigh Branch, sorting and packing fresh produce. She also tumbles, dances, does her homework, and frequents farmer’s markets. Mackenzie is not your average 10-year-old. Since her mom’s recovery, Mackenzie has chosen causes that are important to her and volunteer projects that she can do herself. With the help of her parents, she has worked hard to return those acts of kindness and help others in her community. “You hear about all the bad things children do, that they’re always in trouble. Mackenzie wanted to show people that even little kids can do things, good things,” said Paige. Last December Mackenzie volunteered at the local Salvation Army in Goldsboro, one of our partner agencies. As she helped pack bags of meals for food insecure families, she learned that the food pantry there often runs out of food; an indication, she thought, that the need for emergency food in her community was greater than the amount of food the local food pantries could provide. Her solution? Help provide more food assistance by opening her own food pantry in Goldsboro. “Why not?” Mackenzie asked herself. With the help of her parents, she made a plan. Step one: Find a building for the pantry. She learned that her church may have an extra space available, so she presented a detailed plan to her church, answering dozens of questions about how she would run the food pantry, what supplies and infrastructure she needed, how she would pack the food, and how she would get the word out. Although she admits she was a bit nervous, she was able to answer every question and commanded a unanimous vote—the first time in the church’s history—granting her use of one of the church’s fellowship halls. “It was amazing,” reflected Mackenzie’s mom. They also gave her permission to use part of the church’s large walk-in freezer, perfect for storing turkeys, she said. “Who doesn’t love turkey?” asked Mackenzie. Even after her big accomplishment, there was still a lot to be done. Next she focused on applying for a 501(c)3 nonprofit status and gathering community support. She opened a bank account, started a partnership with a local accounting firm to help her “keep the books,” and organized fundraisers at her dance studio and a local restaurant. She also tapped her 4H leader and recruited the group to host a peanut butter and jelly food drive to help stock her food pantry. She visited the neighborhood Food Lion and asked to put a donation bin in their store. She has even started partnerships with local farmers so that she can receive donations of fresh produce. She also wrote letters to local media and elected officials, asking for their help to spread the word about her new pantry. 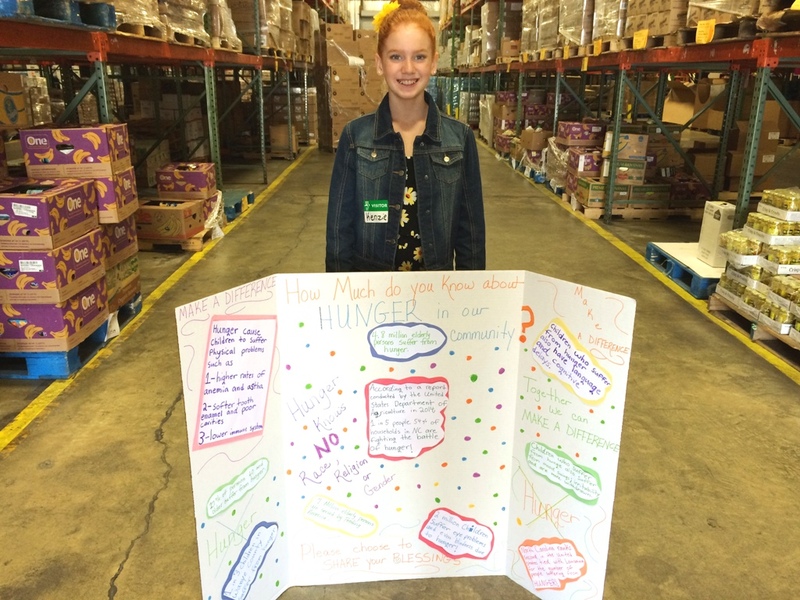 “How much do you know about hunger in our community?” Mackenzie shows off the poster she made to educate people about hunger and how they can make a difference in their own neighborhood. “She’s had a lot of people to step up,” said Paige Hinson. Mackenzie and her family have worked hard these past few months, coming up with more creative ways to raise money and collect food. Mackenzie has also stayed busy writing thank you letters and making baked goods for all of her supporters. 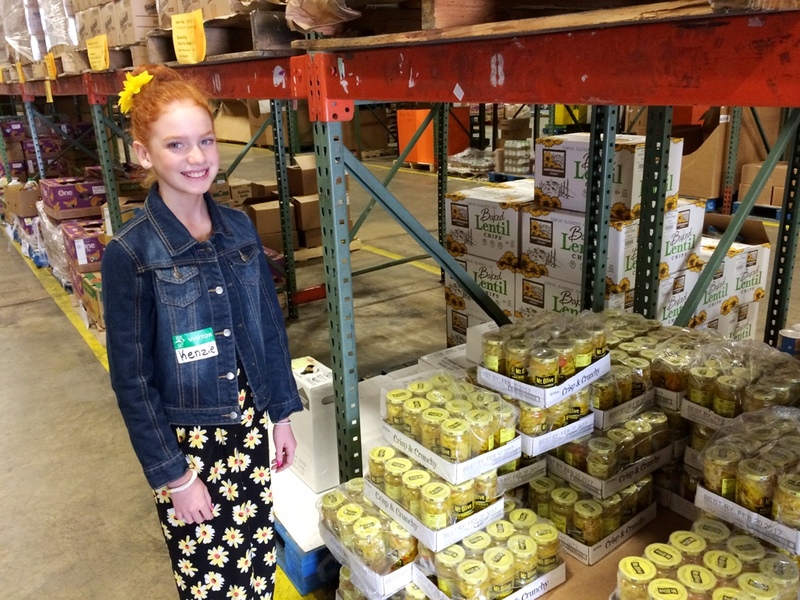 As more of the community rallied for her, Mackenzie’s dream soon came within arm’s reach and she set the date for the opening of her Make a Difference Food Pantry for April 16. Over the last few months, Mackenzie has amassed an army of volunteers both big and small to help her distribute bags of groceries to her local community. Her Make a Difference Food Pantry is now an official 501(c)3 nonprofit organization, a partner agency of the Food Bank, and she is getting ready to take on a local weekend meal program for kids. In her first month she provided 35 bags of groceries to food insecure households, and that number has grown now to more than 90 households served per month. She has also locked down a donation of a commercial refrigerator and freezer so that she can provide more fresh produce and other perishable food. In fact, she has already outgrown the space at her church and is now preparing to move into a bigger site so that she can serve even more people. And we know that Mackenzie won’t stop there. We are so proud of her boundless optimism and vision to pay it forward and help her neighbors in need, and are thrilled to be her partner in hunger relief! Mackenzie checks out the jars of Mt. Olive Pickles in the Food Bank’s Raleigh Branch.